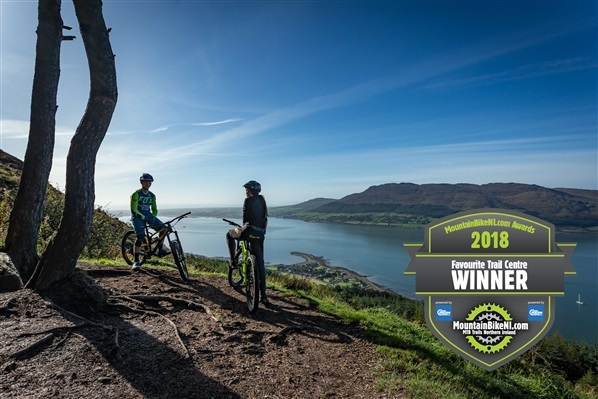 The MountainBikeNI Awards, sponsored by Chain Reaction Cycles, are a great time of year where we can celebrate the very best of mountain-biking in Northern Ireland. Drum-roll please…here’s your 2018 Winners! Taking in 42% of the vote, Rostrevor Mountain Bike Trails came out clear favourite here. Just look at that view – it’s not named Kodak Corner for nothing! 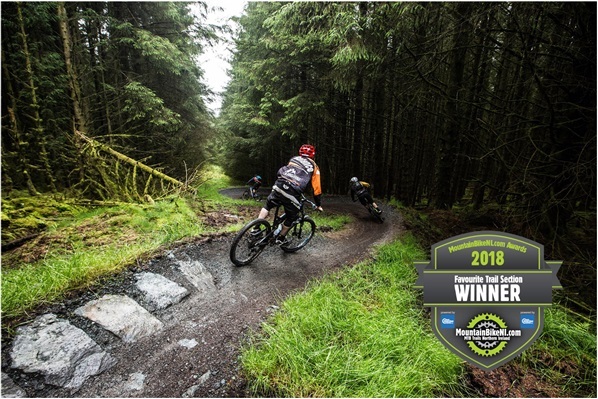 27km of red trail and 19km of black plus purpose-built two downhill trails make this consistently one of the top mountain bike centres in Ireland. A fast, flowy, and extremely fun section of trail, with plenty of berms and a few rock gardens thrown in, it’s not hard to see why the Stream Trail picked up its first ever MountainBikeNI Award – this trail section is definitely worth checking out. Big props to Davagh Forest! 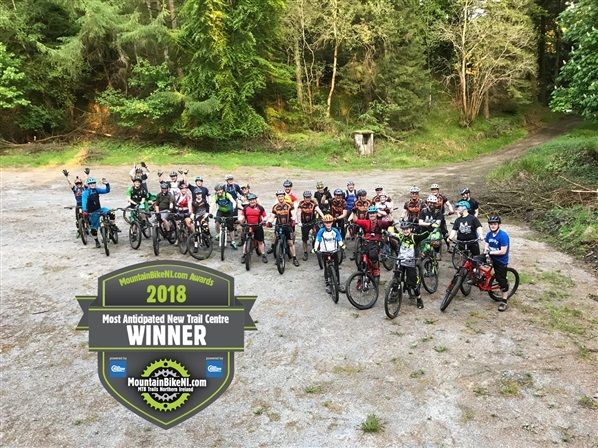 Two sections of Rostrevor Mountain Bike Trails fought it out for second-place, with Home Run receiving 127 votes and Batt out of Hell 126 votes. Trail sections at Castlewellan, Davagh and Rostrevor all received more than 25% of the vote each, showing just how much variety there is for mountain-biking in Northern Ireland. Andy is a familiar face to mountain bikers all over Northern Ireland. 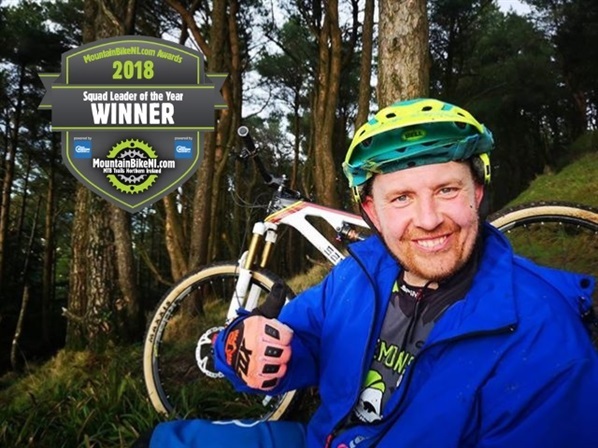 A personal trainer at Positive-Attitude by Andy Coburn, he is a firm believer in the mental health benefits of mountain biking as well as the physical ones. Andy wanted to thank everyone that voted for him, earning him a nice little £50 voucher from sponsors Chain Reaction Cycles. He also asked us to remind everyone that he’s 40, so it’s not just a sport for the young ones! 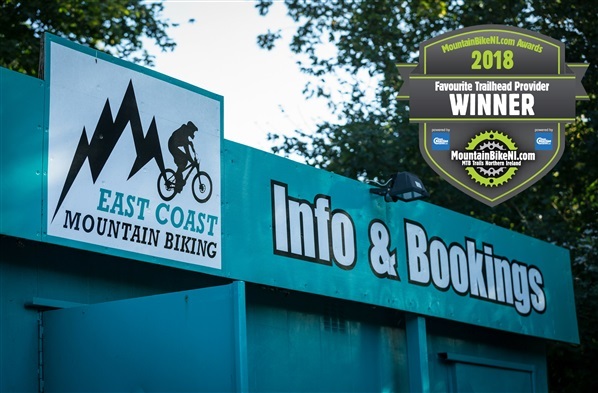 Taking first place in the ‘Favourite Trailhead Provider’ category is East Coast Adventure Centre, the official trailhead providers at Rostrevor Mountain Bike Trails. They provide an uplift service (with free banter on the road up!) as well as providing mountain bike lessons to people of all ages; it’s great to see them receive the recognition they deserve! Shoutout to Life Adventure Centre, Castlewellan and Outdoor Concepts, Davagh Forest who received 35% and 21% of the vote respectively. 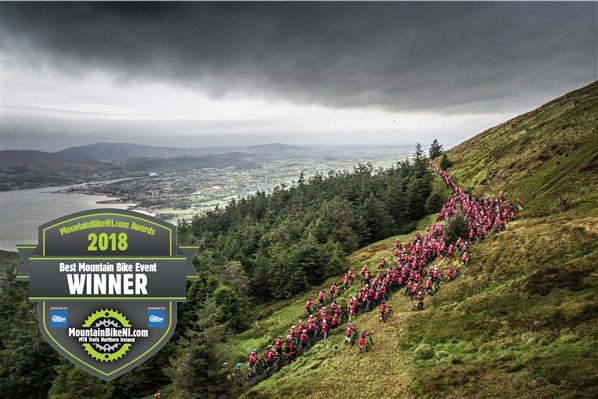 Only two votes separated the top two spots here: in second-place we have Synge and Byrne at Rostrevor Mountain Bike Trails , and our winner for ‘Favourite MTB-Friendly Café’ is…Urban Café in Castlewellan. 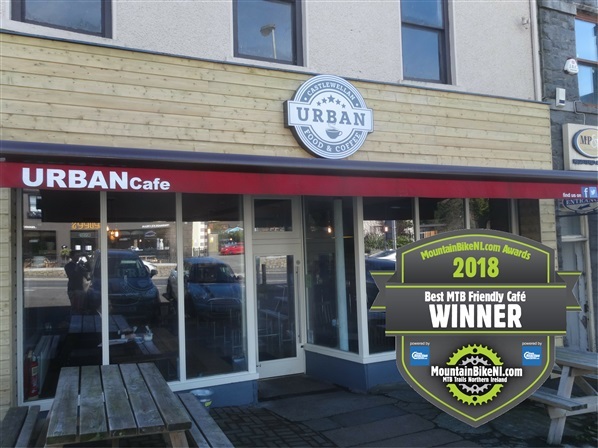 No wonder Urban Café kept on to its top spot – this spot is a haven for mountain-bikers visiting Castlewellan Mountain Bike Trails to rest up and grab a cuppa after a manic day out on the trails. I think we can agree on something – these are two top-class cafes for mountain-bikers in Northern Ireland. Some call this the most important category in the MountainBikeNI Awards – while we don’t know about that, we do know Kilbroney Bar and Restaurant truly deserve this award. Well done to all the team there (congratulate them next time you’re in)! The chaos and craziness of the Red Bull Foxhunt, held at Rostrevor Mountain Bike Trails, ensured it took top spot again as the ‘Best MTB Event of the year’. The Foxhunt was among a number of top-class mountain biking events held in Northern Ireland in 2018, with other events like the Davagh Enduro and the Psycle 24 Hour Endurance Event, Castlewellan also having massive turnouts. It’s fantastic that Northern Ireland is able to host such a great range of events for every level of mountain biker and that they continue to be so popular. 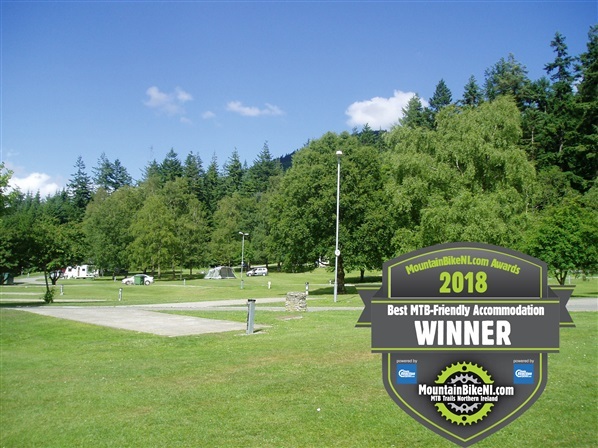 Coming in at top spot in the ‘Favourite MTB-Friendly Accommodation’, we have a new winner this year: Kilbroney Caravan Park, Rostrevor. The Park is situated in a stunning location, where mountain, sea and valley meet to create some scenic wonderland. Overlooking Carlingford Lough, the Park boasts 97 acres of beautiful parkland nestled within the shadow of Slieve Martin and the Mourne Mountains. A special shout out also to the winner of the Garmin VivoSmart Heart Rate and GPS Monitor from Chain Reaction Cycles, Siobhan McGrath and thanks again to everyone that voted in the 2018 MountainBikeNI Awards. Northern Ireland’s Favourite Walking Destinations have been officially named in the 2018 WalkNI Awards. 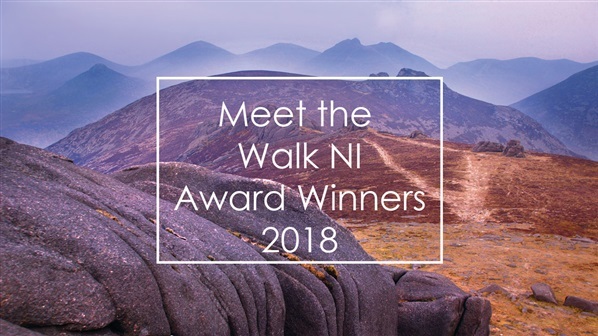 The Mourne Mountains and Causeway Coast & Glens stole the show in the 2018 WalkNI Awards as they picked up a host of accolades, including ‘Favourite Walking Destination of 2018’ and ‘Favourite Place to walk your dog’. Highlighting the very best of walking in Northern Ireland, the WalkNI Awards allow the public to vote for their favourite walking destinations across the country. Featuring some new categories this year including ‘Favourite place to walk your dog’ and ‘Favourite place to watch a sunrise/sunset’, the Awards proved more popular than ever, with over 1,700 votes cast via WalkNI.com. We highly recommend adding these walks and locations to your must explore bucket list for 2019. The Mourne Mountains won the coveted title of the nations 'Favourite Walking Destination' in this years Awards. From summit views to rambles around the foothills and lowland forests, it is unsuprising as to why this location came out on top. Explore this area for yourself by checking out our Walker's Guide to the Mournes. This new category in this year's awards was competitively fought by some of our favourite photographers in Northern Ireland. 'Golden Hour' in the Mourne Mountains was voted walkers favourite location and beautifully captured by Hibernia Landscapes. Voted 'Best Charity Walk of 2018' in this new category, Cancer Focus Moonlit Walk’s came out ontop. These Moonlit walks which reward walkers with spectacular panoramic views of the twinkling street lights of Newcastle Co. Down and Belfast, Co. Antrim from the top of Slieve Donard and Cave Hill in North Belfast. Check out the Cancer Focus NI Facebook page for details of their next Moonlit walk. The Mourne International Walking Festival held onto their title of 'Favourite Walking Festival / Event' in this year's awards. Taking place annually in the Mourne Mountains this festival is an unmissible date in hillwalkers diaries both nationally and internationally. Offering walkers a range of fantastic walks and a lively social scene its easy to see why this walking festival is so popular. Keep up to date with this and other walking festivals on WalkNI. White Park Bay came out on top in this hotly contested category. This spectacular sandy beach under the care of the National Trust forms a white arc between two headlands on the Causeway Coast. It's secluded location means that even on a busy day you can find a place to enjoy one of the most natural coastlines in Northern Ireland. A great walk the whole family can enjoy, this locaion is fossil rich with archaeolical evidence everywhere. Slieve Donard Northern Ireland's highest mountain was awarded the title of walkers 'Favourite Summit in the Mournes'. There are a number of ways you can reach the summit of Donard. Check out the Slieve Donard via The Glen River Trail or Slieve Donard via Bloody Bridge Trail. Where better to stop after a busy day of exploring the Mourne Mountains than Meelmore Lodge Café?! The ideal start and finish point, Meelmore Lodge offers a large car park, camping area and tempting menu of warm drinks and delicious food options. A firm favourite with walkers Murlough National Nature Reserve has once again claimed the title of 'Favourite Nature Reserve' in Northern Ireland. This fragile 6000 year old sand dune system owned by the National Trust was Ireland’s first Nature Reserve. This location boasts an extensive range of habitats to discover including linen-rich hollows, gorse and bracken scrub, and woodland. In another competitive new category in the 2018 awards, dog walkers voted Benone Strand as their favourite location to walk with their dog. Forming one of Ireland's longest beaches this location affords spectacular views along the North Coast, to Inishowen in Donegal and to Scotland. Please note seasonal dog free zones. The Giant’s Lair woodland walk explores Hawthorn Hill Nature Reserve within Slieve Gullion Forest Park. On this trail inspired by legend and mythical folklore, a magical living storybook is brought to life through a trail of intertwined fairy houses and arts features creating a childhood land with dragons, giants and fairies. Visit WalkNI.com for more information on walking routes throughout Northern Ireland including the winning trails, upcoming walking festivals, events and downloadable walk guides.